F.TRON's comment was posted in the article of 'Nikkei XTEC' operated by Nikkei BP Inc., 'appropriate measures against CPU vulnerability problem, correspondence situation of 22 major IT companies'. F.TRON's comment was introduced in the article of "Nikkei XTEC" "appropriate measures for CPU vulnerability problem, correspondence situation of 22 major IT companies".For details, Please look.here. In addition, when viewing this article you will need to register a paid member of Nikkei XTEC. Please acknowledge it beforehand. At our Davos conference, our product "INT - Φ" was introduced. 2018 World Economic Forum Annual Meeting (Davos: Davos Conference) was held from 23 to 26 January 2018 in Davos, Switzerland.Our theme "INT - Φ" was introduced from Nawa of the Cyber Defense Institute,Inc. on the theme of security of the conference. 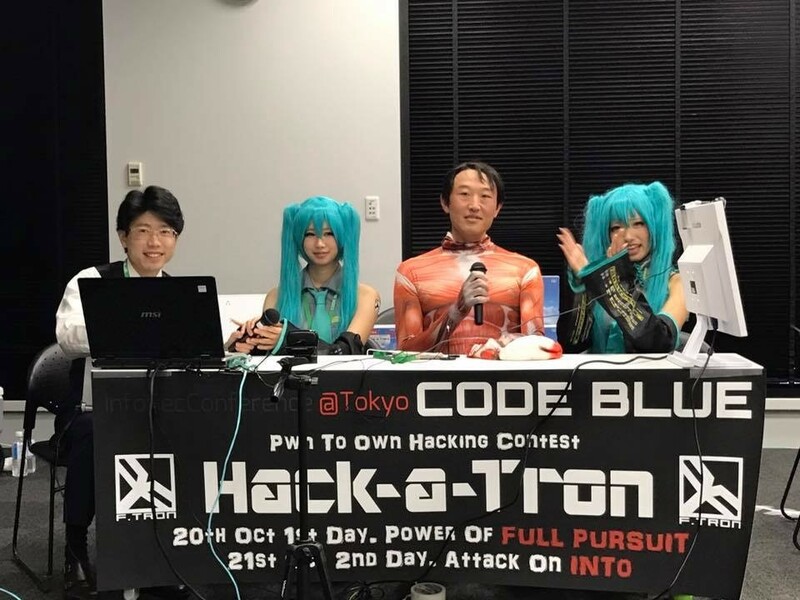 For details, Article of "The Davos Special 2018" of The Japan Times Inc.
F.TRON hosted a hacking contest, “Hack-a-Tron” on October 20 - 21, 2016 at an annual international cybersecurity conference “CODE BLUE” in Tokyo, Japan. The goal of “Hack-a-Tron” was to introduce and promote F.TRON’s products, and to raise cybersecurity awareness, which was the objective of CODE BLUE. As a CODE BLUE sponsor, we initially planned to install the latest model of INT-Φ on the target computers, and promote its technical capabilities and efficacy, but through discussions with the CODE BLUE organizers, if we use the latest model, the difficulty level would be too high for this type of contest, and we were afraid that we wouldn’t have enough contestants, therefore lacking topicality, so we decided to provide a contest version and scenario of INT-Φ for “Hack-a-Tron.” As a result, though this was our first attempt, “Hack-a-Tron” was a great success, with more contestants than expected and even more audiences. We also feel that we were able to provide a good and challenging environment for the contestants. By hosting “Hack-a-Tron,” we hope that we helped contribute to building a secure society for the next generation by stressing the importance of cyber security, proving the danger of cyber threats and the level of technical capabilities. We hope that this message has reached out to many people, not only the cybersecurity experts. Lastly, we would like to thank the CODE BLUE organizers, volunteers, contestants, and the audience for all your kind support and understanding. We hope to see you again next year! F.TRON is going to introduce its technology at 26th annual FIRST conference. F.TRON Inc. is going to introduce a technology concept of its brand-new cyber security software product “INT-Φ” (pronounced int-zero) on Monday June 23, 2014 at 26th annual FIRST conference, for the first time in the world. This conference is for cyber security specialists working at government, defense, and enterprise sectors all over the world. F.TRON is the only Japanese software company which makes a technology introduction. Together with the technology concept, F.TRON is going to demonstrate some new cyber attacking methods and how INT-Φ can stop them. Co-presenter: Cyber Defense Institute, Inc.
operated by Nikkei BP Inc.